6 AM Saturday morning – I head out to Ritvik’s place at the other end of Bangalore. That’s where the four of us – Sunita, Isha, Ritvik and I are meeting before we drive down to the location for our first OD day trek – Skandagiri. A hill fort in the Nandi hills range, Skandagiri is one of the prettier hills around Bangalore, particularly so on some winter mornings when the clouds come down to greet you at the summit. Before night treks were banned there, people used to camp overnight hoping to see that spectacular cloud show in the morning. I have been there once before during the monsoons, but it will be the first time for the other three. Surprisingly, we all reach Ritvik’s place right on time though I have some trouble with the directions to get there. We have sandwiches that Ritvik’s packed for us while Sunita takes the wheels of her Swift. We are in Skandagiri in an hour’s time, and park the car about half a km before the trail begins. It’s around 8 AM when we start walking. The sun is already out, the landscape is quite dry and shrubby all around. There are arrows painted on rocks that help guide us along the right path despite our best efforts to go the wrong way. We set a good pace during the first couple of kilometres when the terrain isn’t that steep. Ritvik and I lag behind a bit while Sunita leads the way through the initial section. About half-way up, we reach a huge rock with a cave-like opening that offers just enough shade for us to sit under and catch our breath. We sit down for ten minutes, eat and drink water and Red Bull. Or more accurately, Ritvik drinks a lot of Red Bull. Rejuvenated, we start walking again, when to our chagrin Ritvik announces he is done. The three of us try motivating him, but with all that Red Bull in his belly, he seems to have decided that he needs a bigger challenge – sleep. In any case, we decide to go ahead and now the trail gets steeper and thornier while the sun begins to beat down on us as well. About 80% of the way up, I sense Sunita and Isha flagging a bit, but just then we see the walls of the dilapidated fort on top of the hill. That motivates them to climb on, but as we get closer, the walls seem to get further and further away. It’s almost an axiom of trekking – the closer to the summit you are, the farther it seems to get. Close to the summit there’s a man cropping some plant. We pass him and soon we find that we have actually reached the top. Sunita and Isha settle down while I walk a bit ahead to take a look. 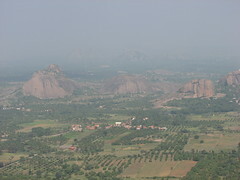 I find that I can see Nandi hills and there’s a wonderful all-round view from the top. Isha and Sunita join me and we find another group of trekkers relaxing there. They seem to have come up on a different route. We lie down for a while warily watching a couple of monkeys loitering around and take in the view. We would have probably stayed a bit longer, but then remember Ritvik waiting down below and decide to head back. The descent is faster, but harder on the knees. We shortly catch up with the other group and pass them. Isha and I lag back while Sunita speeds down skipping from one rock to another. She bumps into Ritvik suddenly – having run out of Red Bulls, he had apparently decided to climb. Soon we are back at the cave rock. We settle down to stretch our legs, take some photos and talk shop. Ritvik gives me a nice tip on using the flash for a particular photo I am trying to take. We relax for quite a while, but finally decide it’s time to head back, and in another half hour we are at Sunita’s car. The local village lady hangs around waiting for a tip. I oblige while Sunita revs up the engine. We lose our way on the return journey and end up taking a longer route through Chikkaballapur town. We halt for lunch at Royal Orchid Yelahanka. The buffet is quite average but we are too famished to care. We drop Ritvik back home and go our respective ways promising each other that we will do another trek soon! It’s been a fantastic day, and as much as we are all looking forward to Sunday to rest, our batteries are fully recharged for the week ahead! 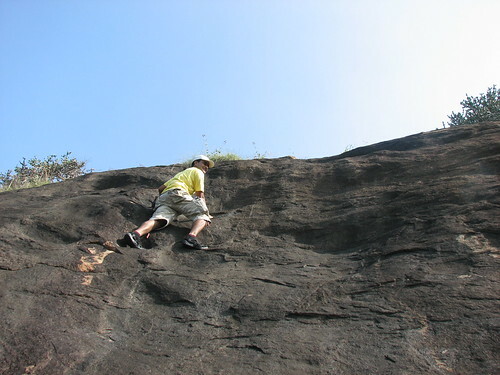 …Awesome trek to Ramanagaram happened this Saturday. Plan was to trek one of the hills in the area, and I had shortlisted Sri Revana Siddeshwara (SRS) Betta after checking out some of the articles on the net. This was about 15 kms from Ramanagaram on the Road to Kanakapura. We reached there only to realize that it was just a small rocky hill with a temple at the top & steps(!) all the way up! That, of course, ruled that hill out. Thankfully, we noticed just a little ahead, on the opposite side, another hill that looked just right. We drove further along towards the hill, but couldn’t quite figure out where to begin the trek from. Stopped a passing motorcyclist, and after checking with him, we parked our cars at the bus-stop near the foot of the hill, and began the ascent. As with our previous trek, we had picked the hill on a whim and had no clue as to the right way up. Last time, we figured out the right way somehow. This time, we weren’t so lucky. About one-fifth the way up, we realized we had hit a dead-end; this huge boulder & dense foliage through which there was no way through. While the others tried to find an alternate route, in an unusual sense of adventure, I ventured further up through an opening the rest had not seen. Was able to forge my way up and thought I had found a good route. Called out to the rest of the junta to join me, which they duly did. Biggest mistake of the trek. That turned out to be just the wrong route to take. Very soon we were scraping our way past thorny bushes trying to find openings where there werent’ any. Everytime we reached a clearing, we would heave a sigh of relief, only to realize a few minutes later that one clearing maketh not a trekking route. On we went anyway, and finally ended up at this rock face (pic below), the only way past which seemed to be a vertical climb up it. I took one tentative step up before I decided that discretion was the better of valour and decided not to attempt any such manoeuvre. Of the seven of us, only KR was brave enough to try it & successfully scaled the rock face. The rest of us decided to stay put & figure out alternate routes. KR subsequently went on his own way, and the six of us looked for alternate routes, and after much moving back & forth, finally figured out a way to reach the top. What had seemed like a relatively simple hill to climb turned out to be a real adventure, with the result that we took over 2 hours to reach the top. Took in the view, clicked a few snaps, talked stuff for a while – about 40 minutes or so. And then began the descent. Must have been close to 12 when we started on our way down. We didn’t want to take the same route down, but were hopeful of finding an easier way. 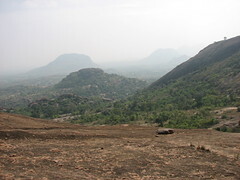 As it turned out, there was one – the regular trekking route on the other side of the hill, but taking that would have meant we da 5 km road walk to reach our cars! That ruled out the easy option and we were wondering what course to take, when a village kid hanging around near the top volunteered to show us an alternate route down. He did help us descend quickly, but it was an even more painstaking descent than the ascent. He led us through thorny bushes that were just right for him to squeeze through. We had to literally be on all fours at places, bend as far down as we possibly could, and despite all that, couldn’t quite avoid a nick or two. In any case, we were back at the base just before 1:30. Drove down to Kamat for a delightful North Karnataka meal before heading back home. In hindsight, we were quite lucky we didn’t step on a snake or two given the general haphazardness of the trek. But it really was a fun trek, and the view from the top made it all worthwhile. 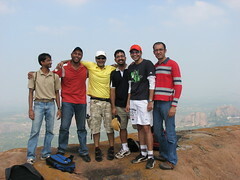 Easily one of the top 2-3 Bangalore treks. The office trekking group has expanded a fair bit since the early days 2 years ago, with the result that the treks are a much more frequent occurrence. We even have a mailing list now. Of the founding four, if I can call it that :-), one has left HP, but the other three of us are still going strong. The flipside of more frequent treks is that I have to necessarily miss a few – else the wife would ask me to settle down in Ramanagaram itself. Nevertheless, I have been on 4 treks in the last 5 odd months, which is a darn good rate. Next up is Kumarparvat, easily the toughest yet – likely to be in the Jan 26th weekend. I think I will have to skip that, but let’s see. The next post, I will list the treks we have done so far. Two treks in the past 20 odd days – pretty cool. 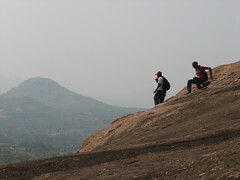 The first was at Sakleshpur end of last month – we had gone to trek this hill called Jenukal near Sakleshpur. Trekked in the morning – it was raining like crazy, and bloody windy. And then, the leeches, which thankfully spared me – courtesy some good preparation with salt/lime/relispray, some sheer panic, and some bloody good fortune. We had climbed about 70% of the way, when we had to call it quits because it got too risky – the last part of the climb was rather steep, the rains had gotten heavier, and the wind was literally blowing us off our feet. A bit of a pity that we couldn’t complete the trek, but the trip was great fun overall. We stayed overnight at an overpriced home-stay, but the food was excellent, and we had a lot of fun chatting, playing dumb-charades and the like. This Saturday was an easier trek – the usual day trek this time. Location – Rangaswamy betta off Kanakapura road, near a place called Horanahalli or something like that. The climb was rather similar to the Skandagiri one, but this time the weather was bloody awesome. I was in fine spirits, and for a change, made it more easily to the top than a couple of the others. About a hour & 45 minutes climb, though it can be done a little quicker if you don’t stop along the way. 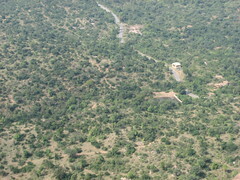 There’s a small cave temple of Balaji at the top & the view is excellent, if not spectacular. We also had to walk a couple of kms from the village where we had parked our car to the foothill, and I could spot some really beautiful butterflies along the path. Lots of birds too, unlike Skandagiri and a couple of the other hills we had gone to earlier. I think this place could make for a good bird-watching visit too. Maybe, another time. We made the mistake of not carrying enough water & food, so, by the time we stopped for lunch at around 3:30 in some restaurant near the Art of Living campus, I had a bad headache. Thankfully, this time, that didn’t lead to nausea, and I was almost fine by the time I got home. After a quick nap, was out again to a colleague’s place who had invited some of us over dinner. Excellent kerala dinner (appams, stew and the like) was had, though I was a bit stuffed and tired out to do justice to the food. Guess this will be my last trek for a while – I thought Skandagiri would have been my last, but with A being in Delhi, I have had weekends to kill, and, but for my addiction to Prison Break, have made fairly good use of it. Wasted another 10 hours on PB yesterday to compensate for the exertions of Saturday.